Architect. It is hoped that this will feed into a wider ‘Design for Carlingford‘, discussed with Louth County Council in late 2016. Draft copies have been circulated to community groups and the completed study will be put on display in early 2019. 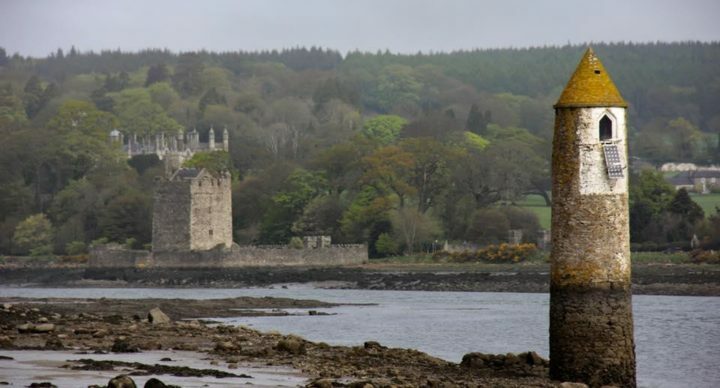 Public Realm funding is to be made available over the next ten years and it would be timely to look at possible projects which might benefit Carlingford. Some of our constituent organizations are addressing public order concerns and are making submissions to the Joint Policing Authority. Carlingford Community Forum is supporting these efforts. The Forum was represented at a Plenary Session of the Public Participation Network (P.P.N.). in the Crowne Plaza Hotel on Wednesday 21st November. Reports were heard from Working Groups and presentations on potential funding opportunities were made by members of the Local Authority. Carlingford Community Forum wishes all residents and visitors a happy and peaceful Christmas. The first anniversary concert for Fr Brendan McNally took place in the Heritage Centre on Sunday 18th November. As predicted on the basis of previous performances by the Fr McNally Chamber Orchestra, it was a sell-out, with music by Vivaldi, Mozart and Dvorak and performances by soloists Rachel and Emma Morrison. It was a cheerful and cosy event, in part because at last our heating system has been improved – with the old radiator system we tended to swing from too cold to too hot and it looked good as well with new carpet on the stage. Note: new, more energy efficient radiators were installed thanks to funding by Louth Leader Partnership under the Rural Development Programme 2014-2020. The Setanta Choir from Dundalk will hold a concert in the Heritage Centre on Sunday 16th December at 4:00pm. We are happy to report that our collaboration with some very creative people from the Dundalk Institute of Technology is broadening and deepening. Recent discussions have centered on finding funding for ways of presenting our history and heritage using Virtual Reality technology. We’ll keep you posted. Following on the visit by a group from the village of Les Vans in Ardèche, south-eastern France, we have agreed in principle to follow up their proposal for a twinning arrangement. We are still working out what it entails as they are talking about a purely informal arrangement but we would like to hear the views of as many people as possible in our community on this idea. We have an awful lot of things that need looking after in Cooley. The sketch below shows ancient monuments listed in the Louth Archaeological Survey – according to some experts north Louth has the tightest clustering of monuments outside the Boyne Valley. The majority are ring forts, which were not military structures but simple earthen embankments built to protect individual farms and livestock, typically in the period 300-800AD. Many of them have souterrains, underground tunnel chambers designed to hide valuables, food and young men and women when the slave hunters were about. There is also a considerable number of tombs, burial chambers for the (usually cremated) remains of chieftains from the Neolithic farming period, roughly 3500-2000BC. Place names referring to these monuments can be confusing, but only dún (as in Dún Dealgan) signifies a real fortress, although lios and ráth could occasionally fit the bill – cashel is loosely used by archaeologists to denote any ring fort structure built mainly of stone. Dating is tricky as our ancestors tended to reuse all sorts of structures – Lissnachiggle (fort of the rye) in Doolargy has yielded remains and artefacts from the transition between Stone and Bronze ages (say 2000BC) up to the end of the 18th century. Late Autumn is a very quiet time for tourists to visit Carlingford and the village and its streets are quiet compared with the peak months of July and August. The CCTA Committee continues to meet and under the Chairmanship of Frank O’Brien is reviewing its role and policy for the coming year. In recent weeks the Chairman with some members of the Committee of the CCTA engaged with the Carlingford residents to examine issues that are of mutual concern to the CCTA, representing tourism interests and the Residents Committee, representing the community. The interaction has demonstrated that the interests of the community and tourism are closely aligned and most of the issues raised are of common interest to all the sectoral groups in Carlingford. In this quiet period of the year, it is opportune to reflect on some of the issues affecting all parties interested in the future of Carlingford, be they residents, visitors, pubs, restaurants, shops, the cultural, historical and environmental associations and other businesses whose livelihood and employment depend on the continuing success of Carlingford, as well as a dynamic, responsible and sustainable center of tourism. It cannot have escaped the notice of anybody living and working in Carlingford that certain recent events of anti-social behaviour, vandalism and downright hooliganism have the potential to damage Carlingford’s reputation as a center of quality tourism, a place for family entertainment, a center of wonderful cultural heritage and scenery and a pleasant and safe place for people to live and work in. This type of behaviour is not confined to our town, as most towns and villages throughout the country experience similar problems. However, as this is our town and we are very dependent on tourism and visitors for employment and the proper development of the place, it is incumbent on the whole Community, supported, where appropriate, by the CCTA and the Carlingford Community Forum to do whatever is necessary to control and contain unacceptable activities that can give our town a negative image to the wider world. While serious incidents are relatively isolated, where they do occur, they are widely reported on Social Media thus potentially reaching a wide audience. Of particular note are three recent instances, the Sunday afternoon disturbances on Newry Street a few months ago, the events of Halloween night and the vandalism and damage to a French sailing ship visiting Carlingford and moored in the harbour. Regrettably the evidence suggests that this type of behaviour is spearheaded, if not caused by a small number of local youths, whose activities bring disgrace on our Community. The CCTA joins with all other responsible groups in our Community in condemning these disgraceful activities, which have the potential to seriously damage our reputation as a center of excellence and a place where respectable visitors wish to come to. However, condemnation is not sufficient and it is up to the whole community to come together to stop these activities perpetrated by a very small section of our community. Residents, parents, guardians and teachers of young people, businesses, both CCTA members and non-members, as well as the other heritage and community groups need to come together to stamp out this anti-social behaviour and vandalism in our community, if we are to prevent Carlingford from getting a bad reputation. It is the view of the CCTA, that given goodwill and cooperation in the community, this situation can be quickly remedied. While the Gardai and the Authorities do an excellent job with limited resources, they cannot be everywhere all the time and it is up to all of us to be proactive in our community. directly involved in supplying these services to provide facilities and manpower to clean up the litter caused by their businesses. Carlingford Tidy Towns do an excellent job in keeping the town clean, which is acknowledged by the CCTA, but their entirely voluntary resources are limited and they can only do so much. Finally, as we approach the period of Christmas and the New Year, with the many attractions and activities (shopping night on 4th December, concerts and plays, music, street entertainment, Christmas festivities, etc.) that Carlingford has to offer, we wish our visitors and residents all the very best wishes of the Festive Season and hope that it will be a very happy and peaceful period for all, as we look forward to 2019. Carlingford Tidy Towns organised a ‘reducing waste’ workshop in the Foy Centre on 17th November when Timi Nicholson gave a talk on how to reduce waste in your home and discussed the 5 R’s – Refuse, Reduce, Reuse, Recycle and ROT. The annual Choral Festival will take place at the end of this month. We look forward to welcoming the choirs to the Foy Centre. Have you booked your Christmas party night out? Don’t forget to check out the Orchard Bakery’s Facebook page and have a look at their tasty Christmas Menu. Availability is limited. If there’s anything you would like to see happening in the centre or on the pitch please contact Debbie Hamilton on 083 8013777. Gerry McGarrity was more than a little stunned to be presented with the award for Environmentalist of the Year 2018 at the Louth Looking Good Awards at the Crowne Plaza Hotel in Dundalk on Thursday 8th November. It recognises his 40 years of dedicated service to Carlingford Tidy Towns and is wholeheartedly deserved. Our Facebook page was bombarded with messages of congratulation. We won a fistful of trophies on the night including the Adjudicators Award of which we are very proud. We also won a monetary prize as runner up in the Waste Minimalization category for our zero waste water stations at sporting events. All the work done at St Oliver’s Park was recognised when they won the award for the best estate in Louth this year and Clos Na Manach held on to their winning ways despite the sad loss of two of their stalwarts, when they won the Best Estate in Category D once again. We are indebted to Carlingford’s businesses for the sponsorship of our new maximum capacity litter bins which we hope will go a long way towards addressing the problem of litter in our town. In particular, Carlingford Accommodation has sponsored the procurement of our first Big Belly Bin pictured above, whilst P.J’s Oyster Bar and Restaurant and Ma Bakers and Bakers Takeaway have each sponsored our new double size bins located in Tholsel Street, at the D’Arcy McGee monument and next to the bus stop respectively. Each piece of equipment will bear the name and logo of the sponsor. Thank you so much for your public spirit and support of the ambitions of Carlingford Tidy Towns. CTT is delighted to report that we have now installed cycle stands and a cycle repair station beside the Station House in the main carpark which we believe will be of huge benefit to people visiting Carlingford via the Greenway and ferry. We are also pleased to be able to report that we have installed three Heritage style, dual language, name signs for each of Trinity Close, Abbey Court, and St Oliver’s Park where formerly there were none. Our TUS workers are currently busy installing our third new Welcome Sign to provide a warmer welcome to Carlingford from the Old Dundalk Road. We will relocate the planter currently positioned under the old road sign to this location as a temporary measure until we decide whether to build a stone surround here, but its proximity to the roadside rather mitigates against this. CTT sponsored Timi Nicholson who came to Carlingford on Saturday 17th Nov to talk about reducing waste. We learned about the 5 R’s. Refusing Is the most important step, then reduce, reuse and so on. You may be surprised that Zero Waste/ Less Waste is actually about recycling less! REFUSE. What you don’t need e.g. junk mail, buying deals (buy one get one free), unwanted presents/freebies. REDUCE. what you are storing at home e.g. clothes, books, kitchen gadgets. Keeping items stashed in your house is a form of waste. REUSE. What you consume. Choose reusable over disposables. (e.g. nappies, hankies etc.). Use your own lunchbox for takeaways, work lunch, kid’s snacks. Donate clothes to charity or freecycle them. RECYCLE. What you cannot refuse, reduce, or reuse. Zero waste does not mean recycling more, it is recycling less. Check out www.recyclinglistireland.ie for what can be recycled. ROT. Compost food waste, and always choose biodegradable material over synthetics. It is possible to compost in your garden even without a brown bin. Thank you to Lush Newry for the soaps, shampoo bars and bubble bath lollies and thank you to Timi for the cloth produce bags. Another seal release took place on Saturday 10th November at Giles Quay this year. CTT together with our TUS workers planted up the edge of the green with narcissus bulbs recently, hoping for a nice display in the spring. Thank you, Louth County Council. We love the addition of these toadstools in the children’s playground. CTT decided to do a bit of work there too by repainting the yellow poles supporting the bridge above and also refreshing the one in the pictures below. We have been rationalising the positions of some of the litter bins in the town in order to locate the largest capacity ones in the most heavily used areas, whilst keeping the heritage ones closest to the centre of town thus enabling us to relocate the remainder to areas where there were none. We have also been mindful to locate them where they will cause least obstruction for the disabled. We have since relocated the modern bin formerly outside the Chinese Restaurant to the school and the post mounted bin that was there to Back Lane. 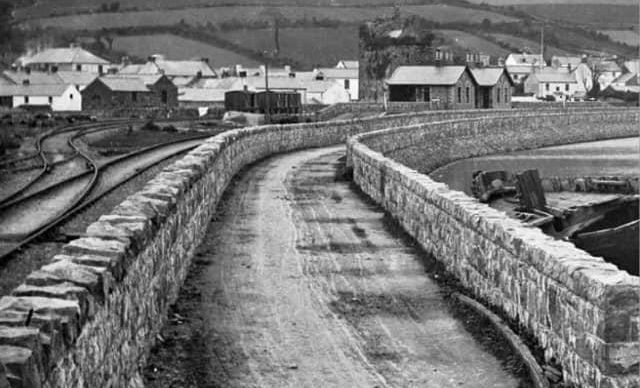 In common with all other Tidy Towns groups, CTT have been given €2,000 to celebrate the 60th anniversary of the formation of National Tidy Towns. Whilst there are still a great many things we would like to purchase for the town, the committee has taken the decision to replace the two picnic tables on the green with sturdy Heritage style ones. These are likely to be installed in January after we have created suitable hardstanding for them. Peace and Goodwill to all from Carlingford Tidy Towns. Huge congratulations to Gerry McGarrity who was recognised as Environmentalist of the Year at the Louth Looking Good 2018 event. Congratulations also to the residents of St Oliver’s Park and Clos na Manach on their success on the same evening. First Place in Category D for Clos Na Manach again this year. Hugh and Gerry would be so proud that the residents have been able to carry on their tradition. seascape feature on their estate. Such a credit to all involved. Well done to Carlingford Tidy Towns and sponsor Carlingford Accommodation on the installation of a new hi-tech litter bin. The CRA welcomed the news that from December 1st, additional gardai are being assigned to Omeath, bringing the number back up to eight. While this is positive news, the ideal situation would be to have Carlingford Garda Station manned full time. The Garda Commissioner recently indicated that reopening of stations would be considered where a need could be shown. The Louth Policing Plan 2019 is currently under development and submissions are invited by the Divisional Superintendent’s office in Drogheda. People should take this opportunity to influence Garda priorities. Posted on November 1, 2018 by St Oliver’s N.S. 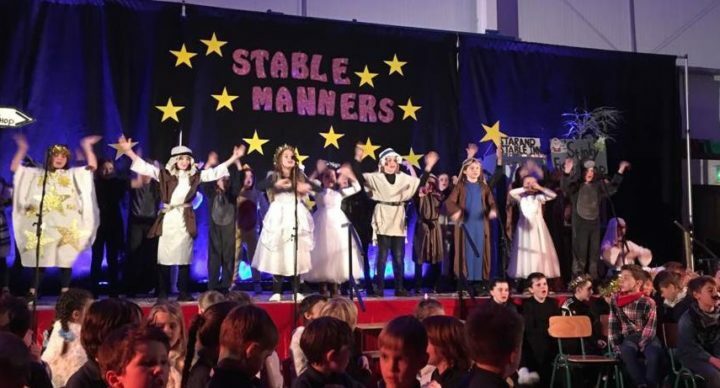 This year we will be presenting our School Nativity Play – Stable Manners on Wednesday evening 12th Dec 2018 in the Foy Centre. Three animals with ‘attitude’ and a lot to prove, fight for pride of place in this nativity play. Stable Manners includes all the traditional elements of the nativity story with plenty of parts for a whole host of characters. Top-notch songs, funky musical arrangements by Margaret Carpenter and a very clever script by Sue Langwade bring the Christmas story bang up to date! Posted on November 23, 2018 by St Oliver’s N.S. Everyone loves advent calendars to count them down to Christmas Day. Most children adore receiving one at the beginning of December because it gets them excited for Santa coming and every surprise that they open on the way is a promise of what’s to come. Reverse advent calendars work by filling hampers with everyday items of food or useful items for the home, for those less fortunate that are struggling at Christmas time. Each Classroom and the Staffroom will attempt to donate a hamper by bringing in the items and donating from the suggested list. Please see below so that when you are shopping maybe you will put a little something extra into your basket to help us in our aim to help others this Christmas. We are encouraging the children to really get involved so as to understand the message of giving and receiving at this special time of year. together as a school we will be giving a Christmas present to families that really needed it. Unfortunately, we can’t continue it for the whole month as school finishes for the holidays and we must have all the items in by the 14th Dec in order to get the hampers ready and donated in time for Christmas. Thank you in advance for your generosity and kindness. Please think about leaving a lasting legacy to Carlingford in your will. The organisations mentioned in this community newsletter are run on a charitable and voluntary basis and can therefore do with all the financial help they can get to continue their work of supplying the social glue for this great town of Carlingford. You could nominate your favourite group or if you decide to leave your legacy to the Forum, then it would be split equally amongst all of the community groups. Carlingford will always have a need which would benefit enormously from your generosity.